Here is an article naming 6 Shrines dedicated to St. Michael the Archangel, but it lacks the 7th, the monastery of St. Michael on Symi. This article adds the Cornwall shrine where others do not. Nevertheless, Bentley Hatchett II writes, “What is the Sword of Saint Michael” that deserves our consideration. ADD: Monastery of Taxiarchis (Island of Symi, Greece). What is factual, countless saints have spent time at all of these shrines. The pilgrimage ought to be revived! Any takers? Today is the feast day of Sts Michael, Gabriel, and Raphael, Archangels. They are mentioned by name in Sacred Scripture in the books of Tobit, Daniel, Luke, 1 Thessalonians, Jude, and Revelation. Catechism of the Catholic Church, 2nd ed., 328-336. Benedict XVI, Homily, September 29, 2007. John Paul II, Angels Participate in the History of Salvation, August 6, 1986. All of us —you, me, the angels, the Son of God— have a mission given by God the Father. 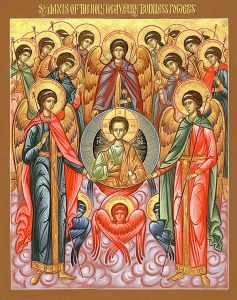 For a moment, let us consider the heavenly beings, the archangels. The archangel Raphael bears a name which means God Has Healed; he appears clothed as a traveler. Raphael wears the traveler’s dress throughout the Book of Tobit because he guides young Tobias on his journey and brings God’s deliverance and healing to Tobit and Sarah. His traveler’s staff takes the form of a caduceus, indicating his special care for those engaged in healing ministries; it’s also conveying God’s healing to Tobit of his blindness. Moreover, Raphael is traditionally seen as the protector of travelers and physicians, plus having agency in bringing Tobias and Sarah together and therefore, he is often invoked by those seeking a loving marriage and a godly spouse. the earth. In Gabriel’s left hand he holds an icon of the Theotokos of the Sign, indicating the Incarnation of the Eternal Word, the Son of God, and in his right he grips a staff surmounted by a lily, symbol of peace, a role he had of sounding the Last Trumpet (cf. Rev. 8:2-5). Christians consider Gabriel to be the angel of mercy and consolation. 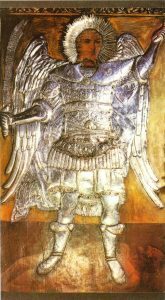 Clad in armor and bearing a shimmering sword, the Archangel Michael, Who Is Like God?, is the champion of justice and angel of righteousness. Michael raises up an image of Man clothed in the white robe of Baptism, while casting into hell Satan (cf. Rev.12:7-9) and the fallen angels who serve him. In several ways Michael is like Gabriel because he is the link between the Old and New Covenants: he is invoked in time of warfare, both physical and spiritual, and to rescue souls from the clutches of the Devil, especially at the moment of death. As Pope Leo XIII reminded the Church, Michael is a powerful heavenly being in the struggle against evil. 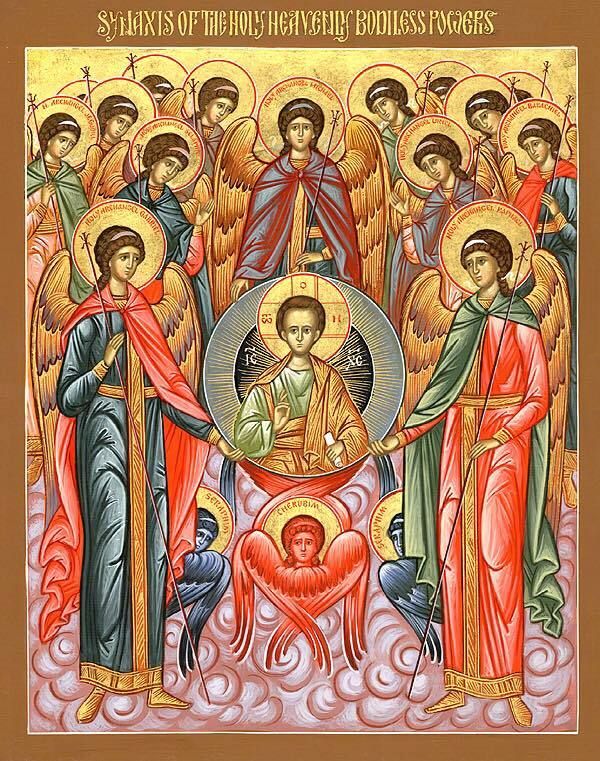 May we revere the Archangels all the more by invoking their protection. The psalm response for today’s Novus Ordo Mass is: “In the sight of the angels I will sing your praises, Lord.” Indeed, this is our position before the Divine Majesty. On the Novus Ordo liturgical calendar the St Michael is joined with Gabriel and Raphael. The only angels mentioned by name (though Uriel is sometimes noted as an angel). Recall, an angel is a messenger, sent, and is deputed by God for a particular purpose, hence, there is no generic angel doing vague things. These days attention is drawn to St Michael due to his fighting the fallen angel and his minions –fighting evil in the world. He is invoked for assistance in doing spiritual battle. 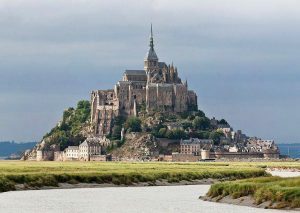 The image above is that of the famed church in Normandy, Mont Saint-Michel. Dedicated to the honor of St Michael it was for centuries locus of a Benedictine monastery of monks and today it is home for monastic Community of Jerusalem. Fr. Dennis Brown writes: Gabriel patronize my intellect; Raphael patronze my will; Michael patronize my heart. Take time to reflect here. Here is a reflection on Michael the Archangel. Pray for his intercession today (and every day). As often as anything very mighty is to be done, we see that Michael is sent, that by that very thing, and by his name, we may remember that none is able to do as God doeth. Hence that old enemy whose pride hath puffed him up to be fain to be like unto God, even he who said, I will ascend unto heaven, I will exalt my throne above the stars of God. I will be like the Most High, Isa. xiv. 13, 14, this old enemy, when at the end of the world he is about to perish in the last death, having no strength but his own, is shown unto us a-fighting with Michael the Archangel, even as saith John, Apoc. xii. 7: There was war in heaven Michael and his Angels fought against the dragon; and the dragon fought and his angels. From the Sermons of Pope St. Gregory the Great. 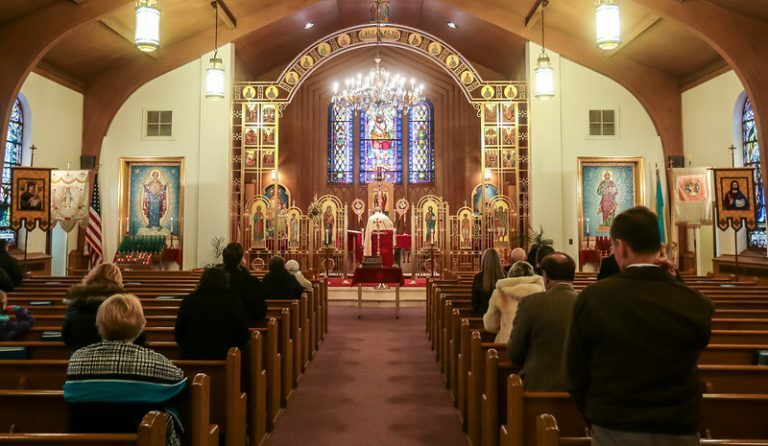 A brand new website for St Michael the Archangel Ukrainian Church, New Haven, Connecticut. St Michael’s is a (Byzantine) Greek Catholic Church under the Eparchy of Stamford.